The Stage 19 July, 1951. 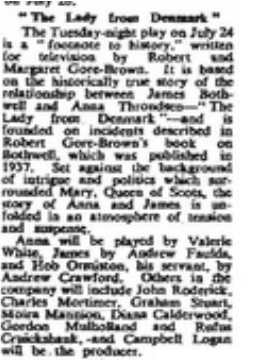 "Anna will be played by Valerie White, James by Andrew Faulds, Hob Ormiston, his servant, by Andrew Crawford. Others in the company will include John Roderick, Charles Mortimer, Graham Stuart, Moira Mannison, Diana Calderwood, Gordon Mulholland, and Rufus Cruikshank."